Form Description: Part of being an independent insurance sales agency is that you can offer your clients other agencies can�t, freedom of choice. However, when you do sell those policies, you will need to be reimbursed in some manner. Here is a Detailed Insurance Information Form that you can use to do exactly that. Simply fill in the required information, send it off to the insurance company, and you are good to go. It really couldn�t be easier. 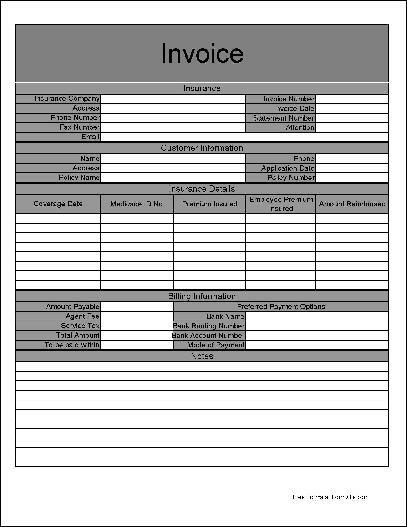 You can download a PDF version of the "Basic Detailed Insurance Invoice Form" form absolutely free. You can also, for a small payment, download a fully editable version of the form that you can customize as you desire. (Don't know which format to choose? Here's how to make your choice.) What would you like to do? Formville's free "Basic Detailed Insurance Invoice Form" form is associated with the following keywords: Insurance, Medical, Inventory, Policy, Reimbursement, Health Care, Basic .